Today's Draw: Ten of Fire from the Gaian Tarot. Is there a fire raging in your life right now? What are the good things being left exposed in the ash? And what of the bad things are worth starting a whole new fire, in order to consume them once and for all? Maybe 10 years ago or so, I drove past a farmer's field that was smoking from a recent fire. I had never seen this before, so I thought something tragic had happened. But then a few miles down the road, I saw another burned out field. And another. This was the first time I realized that farmers occasionally burn fields to kill all the old growth and weeds. Then, I suppose, they turn the soil and plant something new. It's like a clean slate. A field that used to grow soybeans can now grow corn. The same concept is used by nature. Forest fires, for example, are actually necessary to keeping the forest healthy. Too much vegetation can prevent seeds from germinating, stopping the growth of new trees—and thus endangering the generational growth cycle. Also, the denser the forest, the hotter it burns and the more destructive the fire becomes. So occasional fires in the forest are mother nature's form of self-care and even damage control. 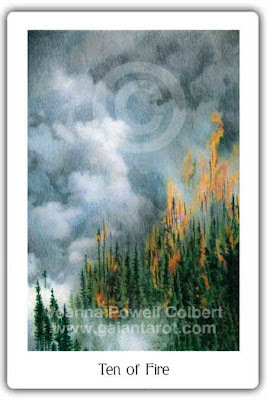 Usually when we see a Ten of Wands, it's depicting someone so overwhelmed, burdened or oppressed that they can't move. They feel trapped in the fire with no way out. Whether it's work or financial matters, family or relationships, we all feel that way at one time or another. Then once the flames subside, whether we wanted it or not, we're left with a fresh slate upon which to write. Over the past few months I have had a bunch of fires burning around me. And the ash they've left behind has exposed some things still left standing that no longer have a place in my life (along with a number of good things I want to keep). Some of them are the things I've written about here...attitudes toward family and the way I handle my own self care. But there are other things I haven't spoken so much about...thoughts about how I spend my time, who I call friend and where my energies have been misguided. Sometimes fires happen to you. And sometimes you set them yourself, clearing what no longer serves to make space for new growth and more evolved life. Anyone else out there need a light?